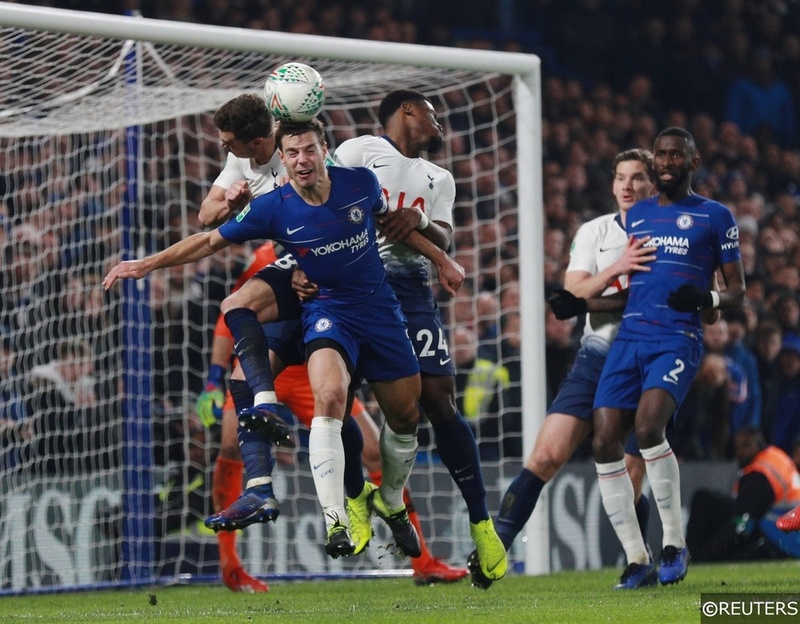 As we enter the final throes of the 2018/19 Premier League season, Chelsea, Tottenham Hotspur, Arsenal and Manchester United are locked in an intriguing 4-way battle for 2 of the division’s 4 Champions League qualification places. The climactic weeks of any domestic season are generally huge tests of a team’s physical and mental endurance, with pressure to win furiously intensified and chances to actually do so quickly running out. It’s also the period of the season where the effects of fatigue can be felt the most, and the rigours of an arduous 10-month campaign start to make players’ muscles and minds scream for some respite. In an attempt to identify which of the 4 Champions League chasing clubs look best equipped to drag themselves over the continental qualification line, we took a look at some of the most relevant data concerning fatigue, freshness and the impact they can have. The ability to rotate players and keep key members of a team relatively unwearied can often be the difference between a strong or limp finish to a domestic campaign. In the table above, we’ve worked out the average number of Premier League minutes that each club’s 10 most frequently used outfield players have accrued so far this season – and our research returned some really interesting results. Chelsea’s 10 most frequently used outfielders have played a whopping 2405.5 minutes each on average to date in 2018/19 – a figure that pushes them out on their own as the most over-worked team by some distance. 4th placed Tottenham have accumulated the next highest number of minutes on average, with their 10 most regularly deployed squad members playing 1955.8 minutes each, a full 449.7 minutes less per player than London rivals Chelsea. 5th placed Arsenal are next in line with an average figure of 1946 minutes per player, while Manchester United, currently occupying the lowest league position of the 4 clubs, also rank last for average minutes played per 10 most used players with 1937.7. Interestingly, our 4 featured clubs have just 5 representatives between them in the list of the Top 50 Premier League players who have played the most minutes this season. Even more remarkably, all 5 representatives play for Chelsea – Cesar Azpilicueta, N’Golo Kante, David Luiz, Antonio Rudiger and Jorginho. Read this week’s Premier League Fantasy Football guide, with tips and 25/1 accumulator here! Next, we took a look at our featured club’s points averages from the first and second halves of the current season, to try to determine which of our combatants are handling the densely packed run-in schedule better than others. In their first 19 fixtures of their Premier League season, Chelsea held an extremely healthy 2.1 points per game average, though the Blues’ figure has slipped back to just 1.85 per contest across their most recent 14 games. Chelsea’s 11.9% decrease on average points taken per Premier League in the second half of the season pales in comparison to Spurs equivalent figure however. Mauricio Pochettino’s men have seem an enormous 38.1% drop in the average number of points they have taken per game over their last 13 games compared to their first 19. What had been title-challenging early-season form has degenerated and dissolved alarmingly as the months and matches trickled by. It feels more than coincidental that the most overworked teams in terms of minutes have also seen the deepest decrease in points in the second half of the Premier League season. Of course, Tottenham players also racked up a total of 4816 minutes at the 2018 World Cup, which is more than any other club in the world. However, instead of the slow start to the domestic season their players’ World Cup involvement was expected to trigger, it looks as though Spurs might be feeling the effects of that post-tournament fatigue at the other end of their campaign. Arsenal also saw a marginal decrease in average points per game, though the difference is negligible. 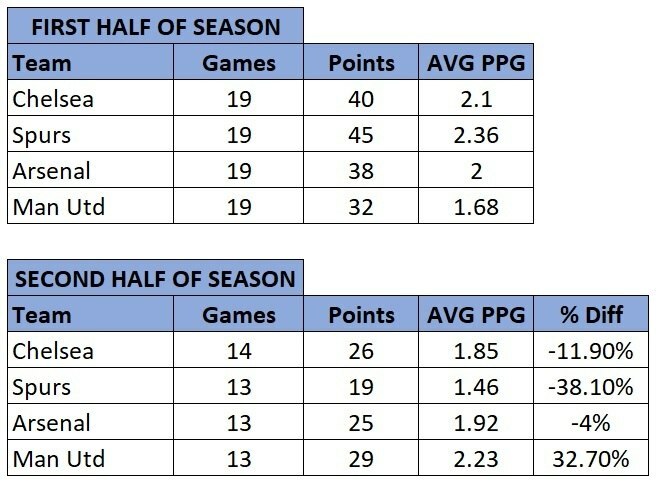 Even though Manchester United’s ridiculous 32.7% jump in points can largely be attributed to Jose Mourinho’s removal in December and Ole Gunnar Solskjaer’s arrival the same month – their comparably low minutes played average could also have played some part in their second half of the season improvement. 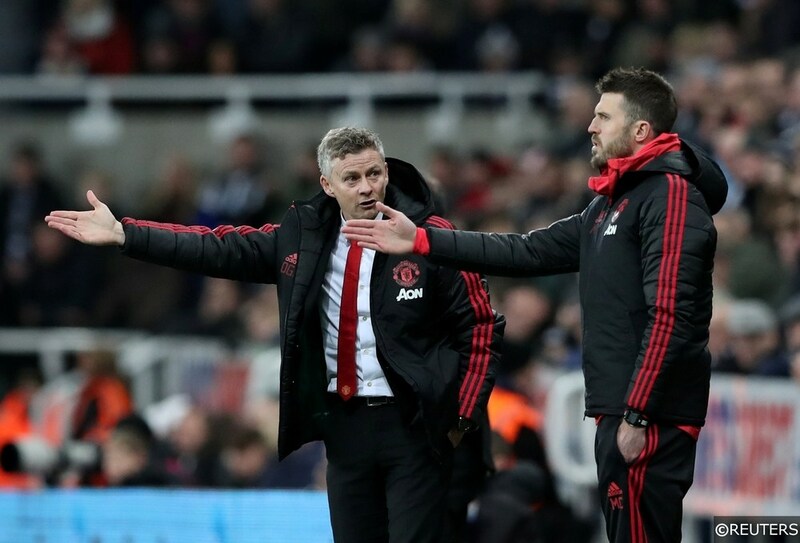 Man Utd take on West Ham on Saturday evening – click here to read our match preview, predictions and betting tips for the game now. In terms of average Premier League minutes accrued per key player this term so far, Manchester United seem to have the freshest look about them ahead of the final month of the season, and Solskjaer’s Champions League qualification aspirations could be further boosted by United’s comparably light fixture schedule. United trail Barcelona 1-0 ahead of the teams’ Champions League Quarter Final second leg at the Nou Camp next week, and it looks relatively certain that United’s fixture in Catalonia will be their last game in the competition this season – that would leave the club with just 7 games or approximately 630 minutes of football to negotiate between now and May 12th. Tottenham Hotspur also have a minimum of 7 games to contest at present, though Spurs’ chances of Champions League progression are much higher than United’s. If Spurs can put their narrow 1-0 Quarter Final 1st leg lead to good use at the Etihad next week, then their end of season fixture workload will increase by a minimum of 2, adding another 180 minutes of running at least into their already tired legs. Elsewhere, both Chelsea and Arsenal look destined to progress deep into this season’s Europa League. 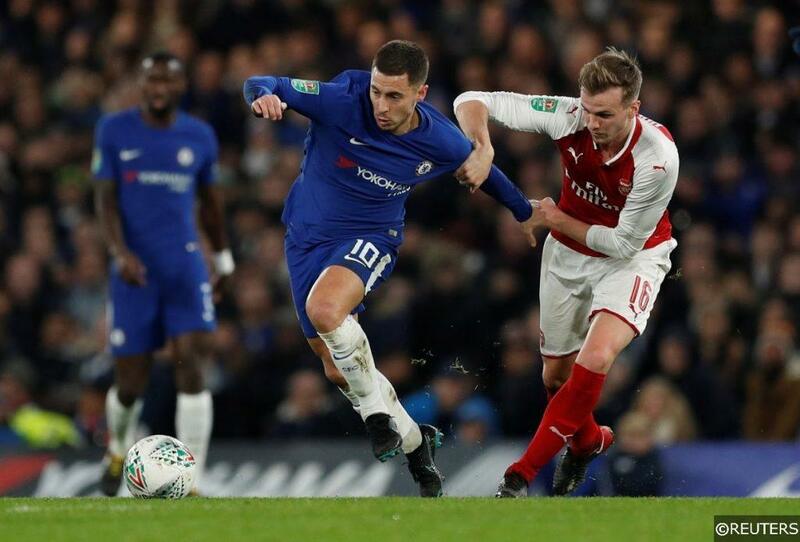 A run to the tournament’s final would leave Chelsea with 9 games (810 minutes) to get though between now and the Europa League Final on May 29th, while Arsenal would play 10 (900 minutes) times across 2 competitions if they made it all the way to the Olympic Stadium in Baku. Naturally, the difficulty of the fixtures in question can amplify the effects of fatigue and Chelsea, Tottenham Hotspur, Arsenal and Man Utd all have Premier League run-ins sprinkled with tricky looking challenges. Chelsea have trips to Anfield and Old Trafford on the horizon alongside their Europa League Commitments, while notoriously bad travellers Arsenal, play 4 of their remaining 6 Premier League games away from the Emirates. Manchester United play 4 of their last 6 games at the Theatre of Dreams, though 2 of those games are against Manchester City and Chelsea, while Spurs toughest looking game is against Pep Guardiola’s title chasers at the Etihad on April 20th. So, who finishes in the top 4? Taking the fatigue effect alone as the isolated and determining factor, the team current priced as the least likely to make the top 4, look one of the best placed clubs to get over the line. At 5/2 with bet365, Manchester United’s chances of finishing in the Champions League qualification places are considered lower than the other 3 clubs involved in the race. Yet, with the possibility of fewer fixtures to play, more home games to come and a fresher squad in terms of minutes played, United have a hugely favourable set of circumstances to take advantage of. With an already over-extended squad facing further Europa league exertion, Chelsea (bet365’s second favourites at 5/6) could run out of gas however, while Arsenal’s (priced at 10/11 with bet365) taxing away-game laden Premier League itinerary and continental commitments looks a nightmare combination to contend with. Having lost 4 and won only 1 of their last 6 games, Tottenham Hotspur already look on the brink of Premier League capitulation, and shorn of Harry Kane’s services for the rest of the season, Mauricio Pochettino will fear that their recent slide is irreversible. Spurs will be banking on their easier looking run in offsetting a large chunk of their other problems however. Even without Kane and their fixture at City excepted, games against Huddersfield (h), Brighton (h), West Ham (h), Bournemouth (a) and Everton (h) are all matches Spurs will expect to win. That quintet of winnable games should allow Spurs to accrue the points they need to secure a top 4 place and their Champions League status, and with Tottenham priced at 2/5 with b365 to do just that, it looks as though the bookies are backing them too. Categories: Blog, Football, and Premier League. Tags: Premier League Analysis, premier league betting tips, and top 4. Team Tag: arsenal, Chelsea, manchester united, and Tottenham Hotpsur. League: England Premier League. Sports: Football.